Cash Bandits is a popular progressive jackpot slot by Realtime Gaming. It focuses on the other side of the law – crime and heists. This online slot attracts many South African gamblers with its bright and exciting theme, and overall rewarding experience. Everything on the slot machine is thematic; there’s nothing superfluous. So, if you love adventure and playing the bad guy in cops-and-robbers scenarios, this is the right slot game for you. Read on for more on Cash Bandits. Cash Bandits features five reels, three rows, and 25 paylines. During the gameplay, Mzansi players get to do daring stuff such as stealing doughnuts, phones, and handcuffs from cops; getting guns, doing heists, and racing police vehicles. Punters get to score loads of bonuses when playing the Vault and Wild Safes features. Unlocking four vaults awards up to 90 free games on Cash Bandits inclusive of large prize multipliers. As the bandit, you get awarded 100 coins when you successfully take a police officer’s doughnut, megaphone, or handcuffs. For guns, you get 250 coins. Meanwhile, getaway cars and sirens get you 500 coins. Another mission is to recruit other robbers which awards you 800 coins. The prizes keep increasing as you complete your missions. Avoiding cops gets you 1 250 free coins. Meanwhile turning over a bank awards an exclusive 1 500 coins. The Wild Safe mentioned earlier on helps Mzansi players win lots of other prizes. 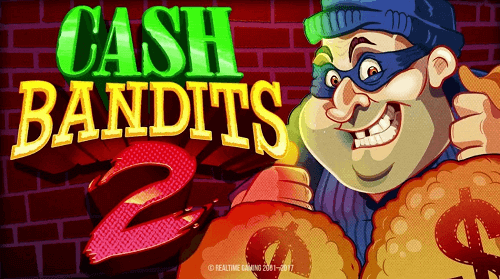 More so, the Robbers symbols and Scattered Cops symbols on Cash Bandits serve two functions: landing three of them gives you access to the Vault Feature and they also award instant wins totalling 200x your total bet. Your initial award during the Vault feature will be five free games. Should you crack the one, two, three, and four digit keypad series, you get more and more free spins. Players get five or more free spins and 3x prizes when they crack the one-digit code. Then you will get ten free spins and 4x prizes when you crack the two-digit code. Meanwhile, the three-digit code awards 20 free spins and 5x prizes. The last code to crack is the four-digit code awarding 50 free games and 6x prizes. Cash Bandits has promising possibilities to win. The bonus features are incredibly amazing. For such reasons we rate Cash Bandits 4.5 out of 5 stars. We recommend that South African players try this progressive jackpot slot for real money once they crack it on demo mode.